Great news: you can now test your iOS mobile apps on TryMyUI! With this addition, we now support user testing of all interface types across all devices. 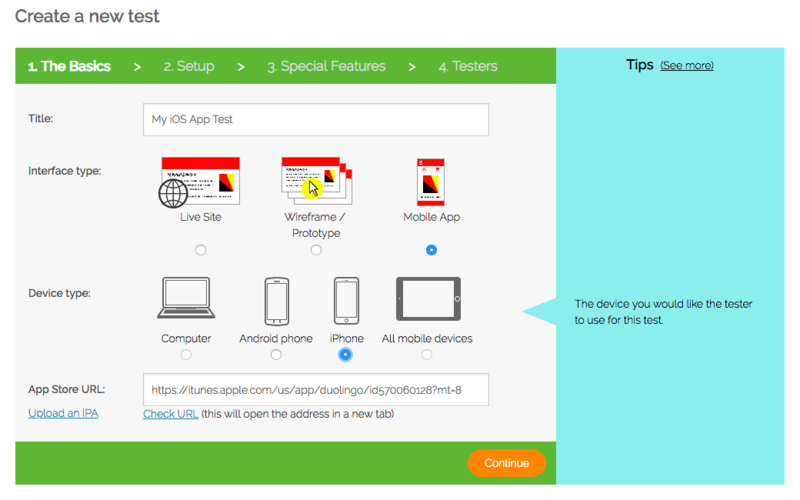 This post will show you how to set up your iOS app test, and how the new solution looks and works. Start by creating a new test. On the first page, you’ll choose “Mobile app” as the interface type, and “iPhone” as the device type. Live app: Then, copy the link to your app’s listing in the App Store, and paste it into the “App Store URL” field. When the test begins, users will be taken here to install your app. Unreleased app: If you have an unreleased app that you want to test, you can instead upload your IPA to be tested. Just click on “Upload an IPA” and choose your file. Testers will install your app before beginning the test; when they are finished, we will disable it to keep it secure. The rest of the test setup will be the same as any other TryMyUI usability test. 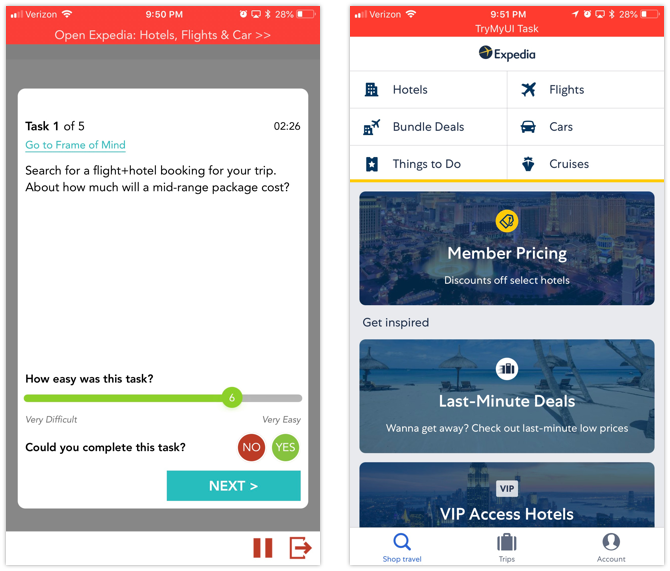 All of our features, including system usability surveys, task usability scores, task completion rates, the UXCrowd, and more, are supported for iOS app testing. The only exception is the impression test. Write your scenario and tasks (keep them short and succinct – screen space is small and users’ attention is short on mobile), add surveys and special features, choose your target demographic, and you’re ready to go! Test your iOS mobile app with our users or yours! We have a panel of users that can be filtered by a number of demographic traits. If your organization has recruited its own people for testing, choose the “I have my own testers” option. They will need to install (and then trust) our app on their iPhone in order to take the test. On the app’s home screen, they will select “Enter your unique ID to begin” at the bottom of the screen. On the next page, they will enter their name, email, and the test code you’ve provided. This does not create an account for them; we only use this information to identify users’ test results. You can also preview the test yourself with our app. Just download it to your device, then use your TryMyUI login to sign into the app. You’ll see a dashboard of all tests you’ve created, and you can preview them yourself to see how testers will experience it. The TryMyUI app will record the user’s screen and voice once they launch the test. A flashing red bar at the top of the screen allows the user to switch back and forth between the task instructions and the app being tested. The whole phone screen is recorded as long as the test is running – even if the user leaves your app or the TryMyUI task view. The user’s gestures are also recorded, including taps, swipes, pinches, and more, if you’re testing an IPA. We currently are not able to provide gestures for live apps in the App Store. Test your products across every device! 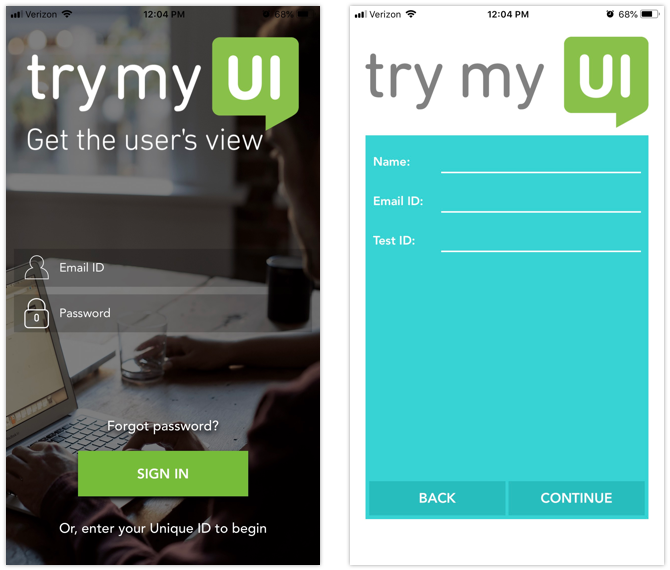 With the full range of TryMyUI’s usability testing capabilities, you and your team can now get feedback on all of your products and interfaces, for every device type. Websites, prototypes, softwares, unreleased apps, and live apps; computers, iPhones, Androids, and tablets; test anything and get the user’s view!